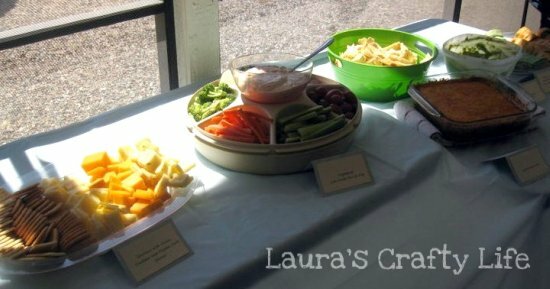 Recently, I was lucky enough to throw a baby shower for a good friend. I was thrilled to be able to share this special day with her and make it great. 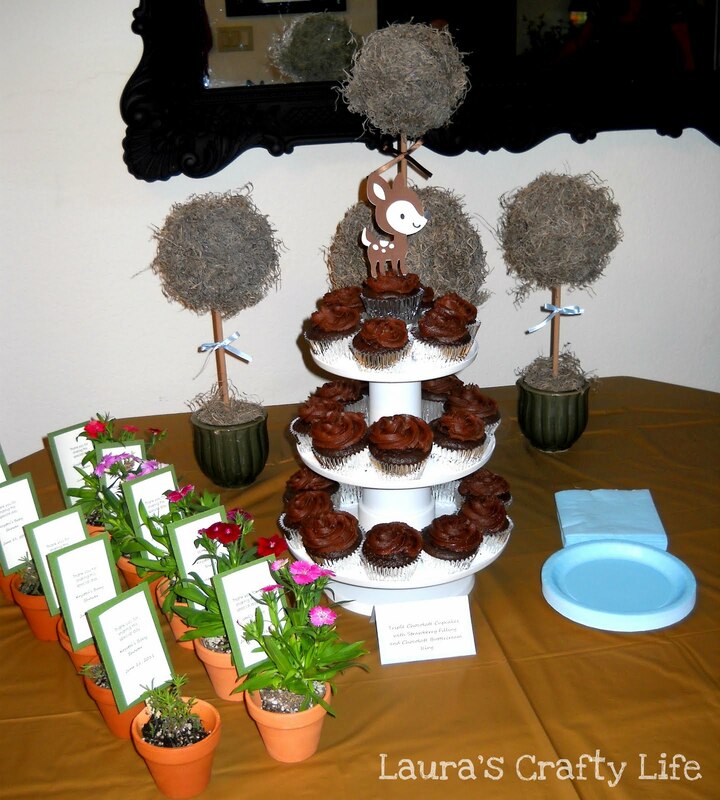 We based the theme of the shower on the adorable nursery theme she had picked out – Enchanted Forest. Today I am sharing how the entire shower came together from the invitations to the decorations, food, favors, and the games. My friend is having a baby boy and chose the absolute cutest baby nursery bedding for her little guy. 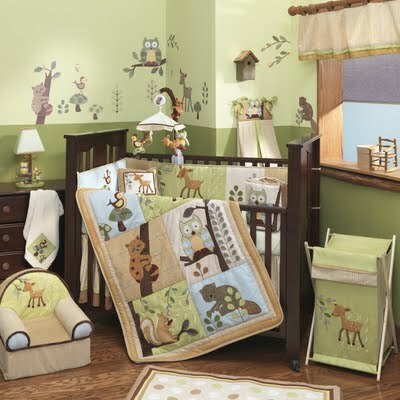 It is called Enchanted Forest by Lambs and Ivy Isn’t it so cute? It was also going to be the perfect theme for the shower – Enchanted Forest! I handmade the invitations using my Cricut. I used cardstock and vellum along with the cutest Create a Critter cartridge to make the little animals. 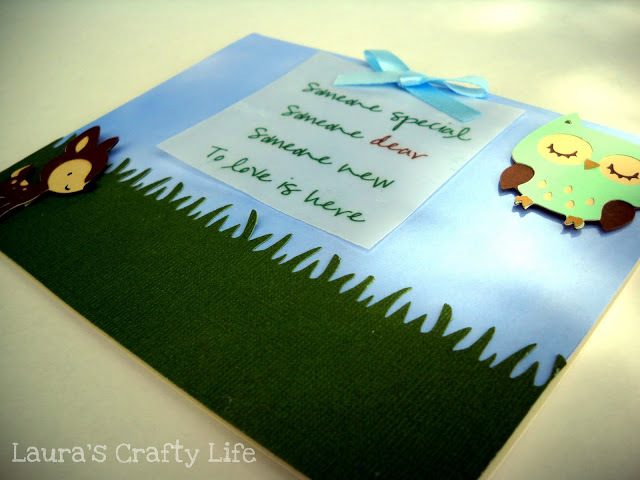 You can get the full instructions here: Baby Shower Invitations. 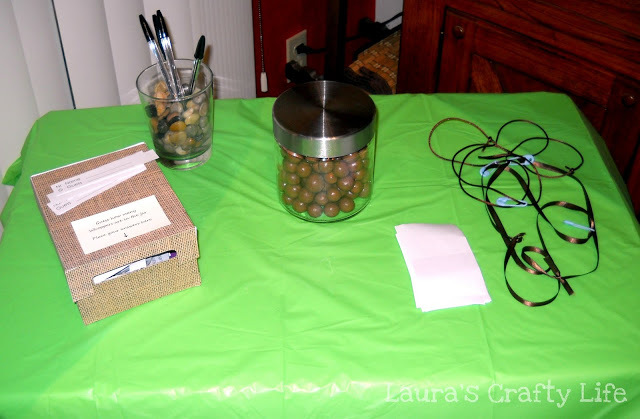 When guests arrived at the shower, I had a door prize game ready. They had to guess how many whoppers were in the jar. They wrote down their answers and placed them in the box. To make the box, I covered a baby shoe box with burlap patterned paper and cut a slit in the front for each person to slide in their guess. The guest who came closest to guessing how many whoppers were in the jar won the jar full of whoppers as a prize. Each guest put on a name tag and also a necklace. Each guest received a necklace. The necklaces were made from brown ribbon with a blue plastic baby pin attached. Everyone was instructed to not use the word, “baby”. Whenever a guest caught someone else saying “baby”, they got to take the other person’s necklace. At the end of the shower, the person with the most necklaces got a prize. I purchased baby shampoo, baby wash, baby wipes, Desitin, a package of Linkadoos, nail clippers, newborn diapers and baby washcloths at Walmart. I showed each item to the guests and had them guess the price of each item.The guest who was able to come closest to the correct total got a prize. I gave all the goodies we used in the game to the guest of honor as a gift. Download the free printable: Price Is Right Game. I cut out blank white cards for each guest to write a heartfelt thought or advice for the parents-to-be. I wanted the soon to be first-time mommy and daddy to be lifted up when they are having a rough day with their little guy. Every parent has those incredibly difficult days where we can use a laugh or some support from our friends and family. This way, a little piece of wisdom is right there waiting when they need it most. 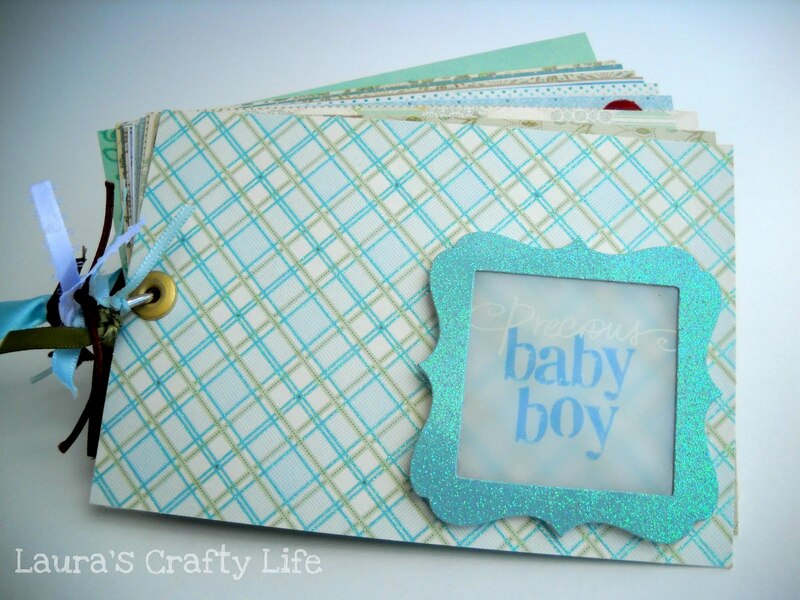 Later, after the baby shower, I put all the advice cards, plus some other meaningful and humorous quotes together into a keepsake album for them. I gave each guest a blank bingo card to fill out with items they thought my girlfriend might receive as a gift. While she opened her presents, each guest crossed off the items on their bingo card. The first two guests to get a bingo won a prize. For the decorations, I kept it pretty simple. The tablecloths were plastic ones from the Dollar Tree or Hobby Lobby. On the main table, I used a gold colored tablecloth. On the table for food was a light blue one. 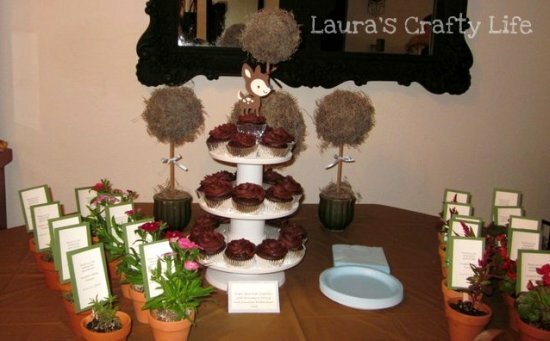 The main table had the moss topiaries that I made. The cupcakes were on this table. They were very simply decorated. 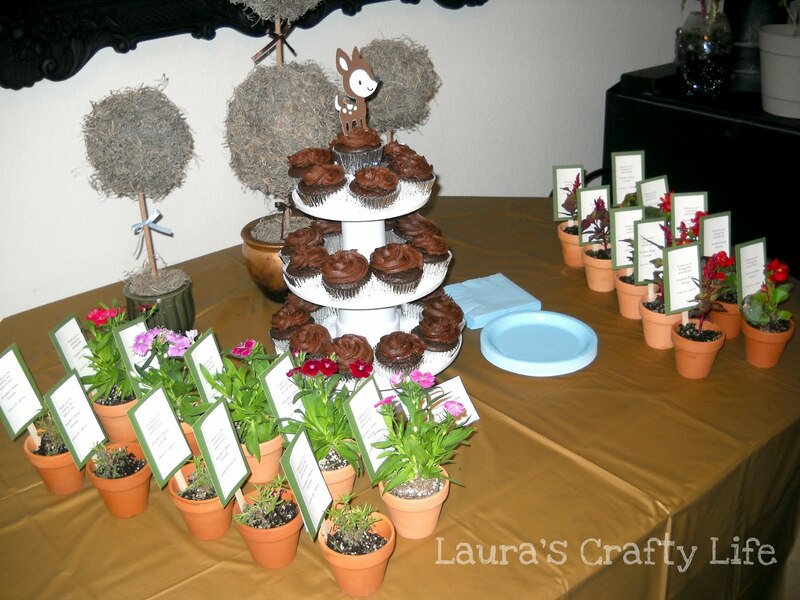 To adorn the cupcakes I placed a deer that I had cut out with my Cricut Create A Critter cartridge on the very top cupcake. This deer matched the ones I had used for the invitations, he was just bigger. I also created a ‘Baby Boy’ pennant banner to hang above where she would be sitting opening gifts. It turned out so cute. I cut each flag from different colored scrapbook papers. The letters were cut using my Cricut. The letters were dark brown cardstock with a green textured cardstock underneath. I attached each flag to a green ribbon with adhesive tape. These are the papers I used for the banner (most were purchased at Hobby Lobby). 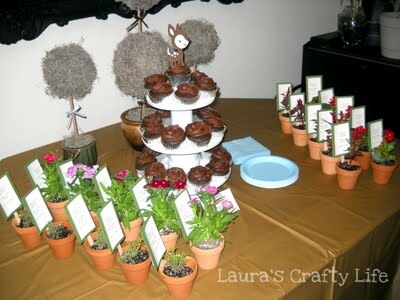 I wanted something practical and cute that the guests could take home with them. I purchased small terra cotta pots from Hobby Lobby and placed one small plant in each one. 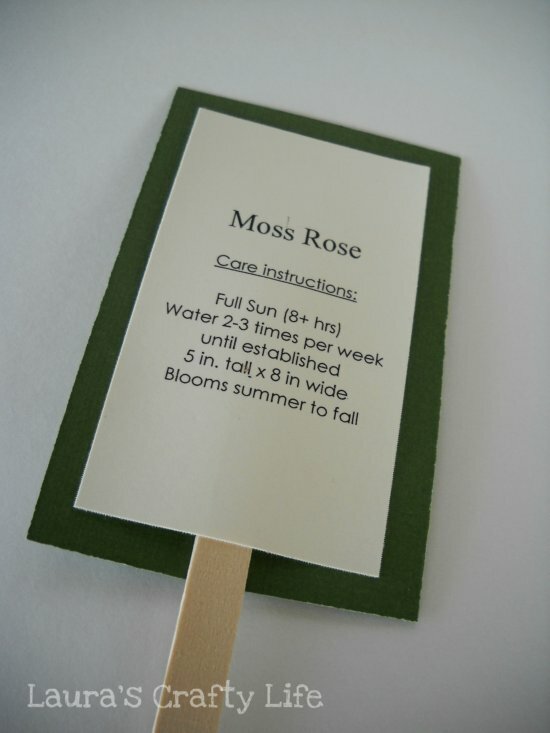 To make the garden tags with a thank you on the front and care instructions for the particular plant on the back, I glued a popsicle stick into the middle underneath the cream cardstock to be able to insert them into the dirt. They really looked nice on the table and added an extra decorative touch. I made little tags to identify what each food item was. I simply adhered a printed out card onto a larger piece of cardstock that was scored and folded in half. Cupcakes: Triple chocolate with homemade strawberry filling and chocolate buttercream icing. This post made me smile. Thanks for inspiring me and many others to even attempt this feat. Really appreciate that you linked up at the Creative Bloggers’ Party & Hop. You did a great job organizing the party. The games sound so much fun. 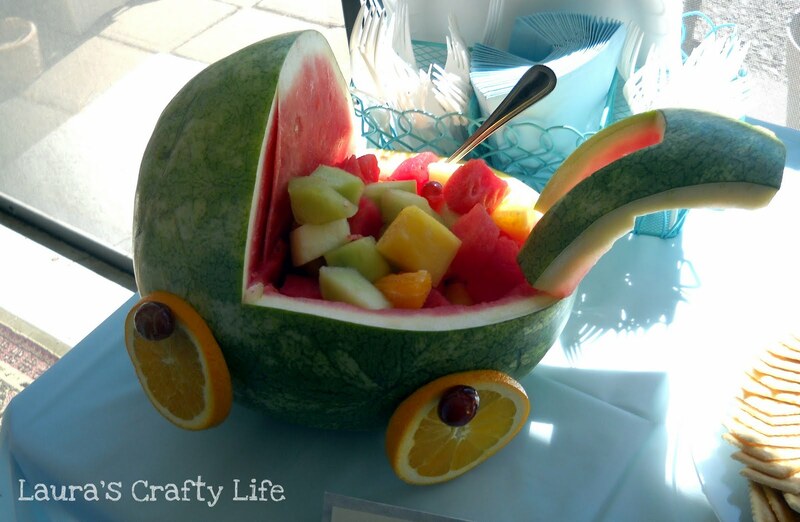 I liked the watermelon cart and the Advice Book. Pinning pictures. 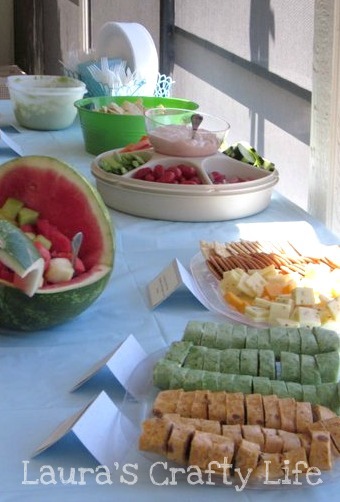 We have a link-up party going on – Tea Time Thursdays @ Kreative Korner. I would really appreciate if you’d link up some of your awesome posts there. Hope to see you at the party. I love the games that you used at your shower! I tried clicking to get to the printable versions, and for whatever reason your links are dead. Are you still willing to share your baby animal and Price Is Right games?